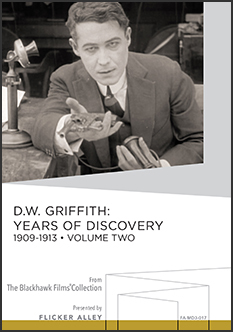 Shortly after this blog began, I reviewed a DVD collection of D.W. Griffith movies that was (and is) readily available through Interlibrary Loan, originally released through Image Entertainment. However, it is out of print, and thus unavailable to many of you who lack access to a well-funded library system (or who, for reasons I cannot fathom, eschew libraries), unless you want to comb the internet for a used copy. Thus, you may have to settle for this version offered through Flicker Alley’s “MOD” (Manufactured on Demand) service, produced through Createspace, the makers of fine books which are completely plagiarized from Wikipedia articles. These DVDs are by no means as good as the original release. They lack the informative commentary track of the original release, as well as any other special features. Indeed, they lack certain features some of us have come to expect on DVDs, like, oh, a menu for instance. These are simply “plug-and-play” DVDs which autoplay the entire set of movies from the beginning every time you put them in. At least each movie is its own chapter, so it isn’t too hard to navigate to a particular one. The image clarity is very good, although for some reason on my set the image insisted on creating a black box around the whole thing that shrank it down without actually changing the aspect ratio. In short, this collection in its present form is adequate, but hardly great. Hopefully one day the full functionality of the original will again be available for purchase, through one medium or another. Find it, and other Flicker Alley MOD offerings: here.